Last November MP Greg Warren wrote to NSW arts minister Don Harwin on behalf of the Campbelltown Arts Centre, calling for more funds for the cultural hub of the Macarthur region. Mr Warren told the minister the centre is in need of more funding to push ahead with expansion plans, increase participation outside the centre and hold more than one major exhibition per year. No response was received from the minister by the time NSW Labor announced, earlier this week, it would create a $100 million Western Sydney Cultural Fund, which could potentially provide a large injection of funds in Campbelltown and the wider Macarthur. A NSW Labor government would also double the Regional Cultural Fund to $200 million; create a $15 million theatre and playwright support package; and introduce a $40 million Regional Conservatorium of Music Fund aimed at supporting students outside of Sydney. A delighted Mr Warren quickly backed his party’s election promise on the arts. Election promise: Labor MP Greg Warren and veteran councillor Meg Oates outside Campbelltown arts centre. “Premier Gladys Berejiklian and her Liberal colleagues seem to think that artists and art enthusiasts only exist within a 20 kilometre radius of Sydney,’’ he said. “The state government has painted a grim picture for the western Sydney arts world since the Liberals came to power in 2011. 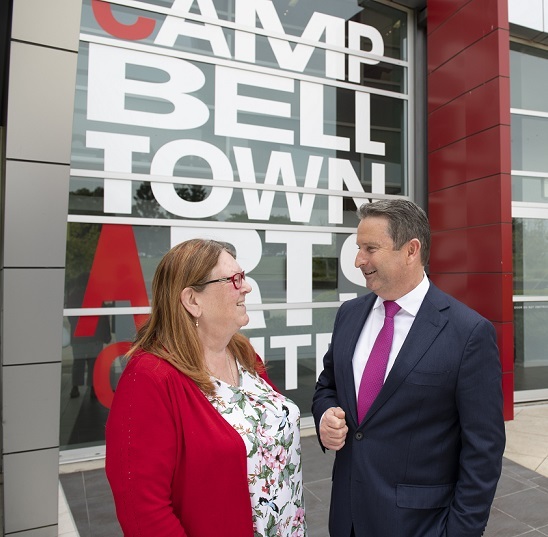 “Campbelltown Arts Centre can only do so much with the little funding it receives from the state government. “Labor recognises the funding barriers faced by those within the western Sydney art world and we are determined to provide much needed and overdue relief,’’ he said. Mr Warren received local support for his stand from veteran Campbelltown councillor and advocate for arts in Campbelltown, Meg Oates. “Arts activities are the social glue that holds communities together,’’ she said. “People tell their stories and their dreams through art. “Our Campbelltown community is growing and constantly changing.